Living in the south we rarely see snow, especially like lake effect snow I experienced as a child in Buffalo, NY. 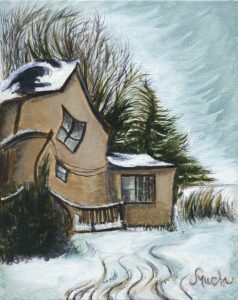 Today’s image was inspired by my father in-law’s childhood home. Location: Ellendale, MN. Be sure to cheer me on while I create fifty paintings this year. To kick off the journey, starting in February I will paint along with other artists from around the world participating in the Leslie Saeta 30 paintings in 30 days Challenge. Wish me luck!! MEDIUM I’ll be painting in acrylics on gallery stretched canvas and panels. I am craving oil painting again. So, there might be the occasional oil pastels creations to be safe around my 8 yr old son. SUBJECT MATTER I am curious to see where a variety of landscape paintings, musical instruments, and cityscapes will take me for 1.5 hrs per day. 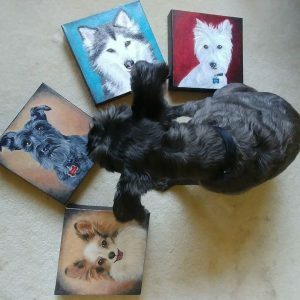 Last year I had a goal to perfect pet portraits and this year I am continuing my portraiture service after my daily painting time is completed. SOCIAL MEDIA I’ll be posting here on a daily basis as well as my Facebook and Instagram Page, please follow along!! JOIN THE CHALLENGE! Are you inspired yourself?! This is a great way to develop the habit of going into the studio til it becomes a regime. Check it out at: 30 Paintings in 30 days Challenge hosted by Leslie Saeta. Time to organize my studio. see you tomorrow for painting 1 of 30! You can usually find me working at my easel, but that does not happen until my brain is set for the day. Each morning before heading up to my second-floor art studio, I fix myself a pitcher of water and a healthy snack for later. This simple ritual triggers my miniature schnauzer Marcie to run up the stairs and straight for my art studio door. It is like she is keeping me accountable looking up at my studio hours. 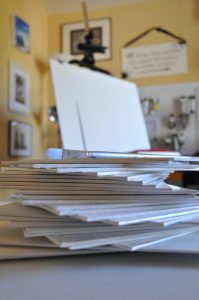 My schedule is flexible, but it visually helps others and myself to see my art making hours. Marcie waiting to enter my Art Studio. So, while my husband works away at his office and my son attends elementary school, I escape into my world of creativity. I turn on music or enjoy the silence of my studio. I began using a journal during my college years. Before I would start to create, I wrote a few pages in my journal.” I found The Artist’s Way written by Julia Cameron at a used book store. Her book discusses how to write three mourning pages each day. I found after writing on my pages I had increased creativity. I empty all of my thoughts of gratitude or whatever comes to mind onto the page, and then my painting ideas and logical flow onto the next page. I did not realize at the time I was using my whole brain to think like an artist. Now as a mom, I have read Dr. Dan Siegel’s, The Whole Brain Child. This was a major “ah-ha” moment for me to have my creative practice clarified after all these years. Just like in Siegle’s book, I was experiencing the logical side of the brain that follows after emptying the emotional side of the brain. Warning: Whole brain techniques will not work if you are tired and/or hungry at any age. Be sure to sign up for my newsletter to receive more tips on creativity and my upcoming art events. Leave me a comment to share your journaling habits.